Plates, Bowls and Straws. 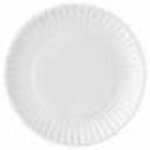 If you have a specific plate that we do not carry (there are many to choose from), please let us know. We stock the ones that have been most popular in the past, but are always open to stocking new products as they become available.